Raymond A. Erickson, Jr. of 245 Williams Street, Middletown, was born May 5, 1938 in Connecticut, son of Sophie (Kurneta) and Raymond A. Erickson. 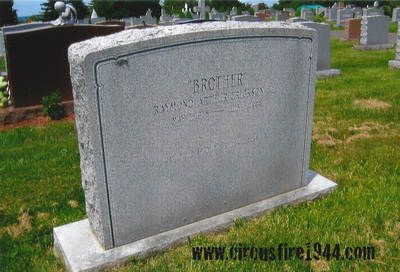 Raymond was assumed to have died from injuries received at the circus fire, although his body was never identified. 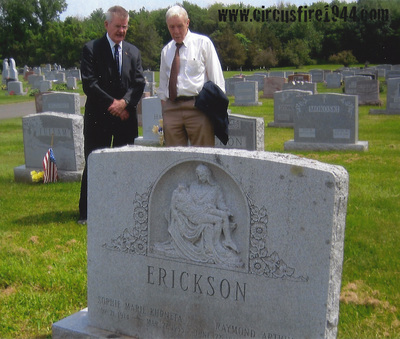 He attended the circus with his uncle Stanley Kurneta, 26, his aunts Mary, 18 and Elizabeth Kurnetta, 9, his grandmother Mrs. Frances (Platek) Kurneta, and his cousin Anthony, 4, and the group sat in reserved seating section S, four rows from the top. When his uncle Stanley noticed the fire, he led his family toward the main entrance and found that a steel animal runway at the NW corner of the big top blocked their way. Stanley pushed Frances, Elizabeth and Anthony over the chute and got them outside, then went back into the burning tent to find his sister Mary and nephew Raymond, but the intense heat forced him out. He continued his search on the circus grounds and was unable to find Mary, but he did find Raymond on a board near a circus wagon with serious burns to his face and neck, sobbing quietly and eyes rolling side to side. Stanley picked the boy up and rode with him in an Army truck to Municipal Hospital, then carried him to the fourth floor and placed him on a mattress on the floor in the corridor. Stanley asked a priest to give the boy his last rites, then he left the hospital to find those he left behind. When his search led him to HPD headquarters, officers on duty there took Stanley to the hospital to receive treatment for his own burns that were so serious that he spent over two weeks hospitalized. 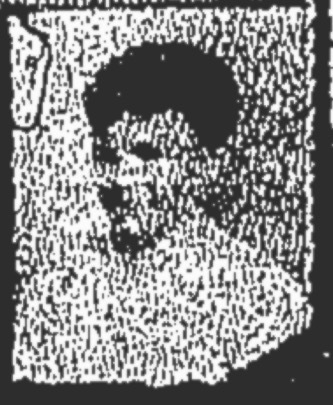 Mary Kurneta was among the dead removed from the grounds and later identified at the State Armory. Raymond was described as 6 years old but with the height and build of a nine year old, sturdy and round faced, straight brown hair, large hands. His arm had been broken just above the wrist a month earlier, and he would have genetian violet stains on his arm from three days earlier when a doctor treated him for a blister caused by the case he had on his arm. His teeth were straight and well spaced, 2 front upper and 2 fron lower teeth were adult teeth, and several molars with cavities. He had never been to a dentist, so no records were available. His uncle said the boy was fully clothed and wet when he brought him to the hospital, wearing a white shirt with brass buttons and a yellow stripe on the collar, blue chevrons and a blue eagle on the left sleeve with Navy blue shorts, a belt with a black buckle, brown sneakers with a knot in the laces that his mother had tied that morning and blue socks. Raymond's father inspected the bodies at the State Armory and was certain that his son was not there. Sophie Kurneta inspected a box of the victims' belongings at Municipal Hospital and found her son's shoes with his socks tucked inside them, but no other traces of the boy. All of the hospitals, the morgue, the Hartford Police Station, funeral homes and the coroner's office were all checked and questioned about Raymond's remains and clothing, but nobody had any knowledge of him. The investigating officer for the Connecticut State Police declared that "some errors were made", and Medical Examiner Dr. Weissenborn believed that someone else claimed Raymond as their own child. Mrs. Erickson declined to have the investigation continue, not wanting to disturb the other parents by informing them of the mistake. Raymond's estate was awarded $6,500 by the arbitration board. In addition to his mother, he is also survived by his father, Raymond Sr., who was called back to duty in the U.S. Navy shortly after the fire.